Joined on January 20th 2011, last online 3 days ago. Eu to mas não ando tendo muito tempo. É pouco provável que jogue no lançamento. Is DSIII being what you expected? Yes, its the best in the series in my opinion. Awesome game. Cool, I heard it's the shortest, tho. It has more of the Bloodborne action on it, was it what you enjoyed better than the others? Its not short at all if you are exploring, it will easily take 50+ hours, I took over 70 hours on my first playtrough but I did absolutly everything possible including farming covenant itens. But like every Souls games you can just rush trough it if you want, I dont see the point in doing that tough. Its slower than Bloodborne but faster than DS 1 and 2, its a perfect balance imo, made the gameplay better than both formulas. And the game just feels awesome, the level design, world building and the sense of imersion was greater to me even compared to how I felt when I played Demon Souls, wich was the first one I ever played and everything was novelty. Nice, it seems like it was a good thing Miyazaki went back to Dark Souls. Wonder whay they'll make next, now. Hows it going? What you playing right now? PC or Sony? I generaly play my PS4, only rarely play stuf on my PC. Ive just finished getting a platinum trophy on Resident Evil 0 and Im waiting for Dark Souls 3 now. 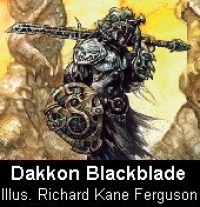 Who is Dakon Blackblade anyway? He is a character Magic the Gatherings universe, has a card and all. He kinda looked like a Warhammer character.